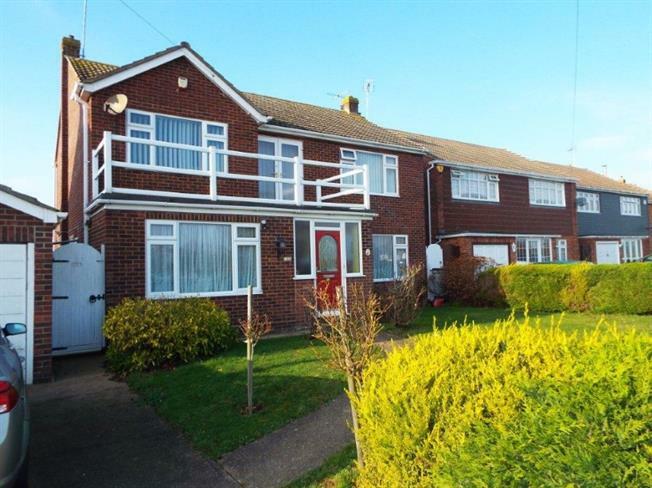 4 Bedroom Detached House For Sale in Clacton-on-Sea for Asking Price £325,000. Bairstow Eves are pleased to offer for sale this substantial four bedroom detached house which is located opposite Millers Barn Golf Course in the Western outskirts of Clacton On Sea. The property offers generous size rooms and features lounge, dining room, kitchen, downstairs shower room, balcony, four piece bathroom suite, garage, driveway and enclosed rear garden. The property is also within half a mile of local shops and a viewing is highly recommended to really appreciate what this property has to offer. UPVC patio double glazed door, opening onto the garden. Double glazed uPVC window facing the front. Radiator, carpeted flooring. Side , opening onto the garden. Double glazed uPVC window facing the rear overlooking the garden. Radiator, tiled flooring, tiled splashbacks. Fitted units, stainless steel sink and with mixer tap with drainer, freestanding oven. Double glazed uPVC window with obscure glass facing the side. Heated towel rail, tiled flooring, tiled splashbacks. Low level WC, walk-in shower, top-mounted sink. UPVC patio double glazed door, opening onto a balcony. Carpeted flooring. Double glazed uPVC window facing the front overlooking the golf course. Radiator, carpeted flooring, a built-in wardrobe. Double glazed uPVC window facing the front overlooking fields. Radiator, laminate flooring. Double glazed uPVC window with obscure glass facing the rear. Heated towel rail, tiled flooring, tiled walls, spotlights. Low level WC, panelled bath with mixer tap, walk-in shower, pedestal sink with mixer tap.